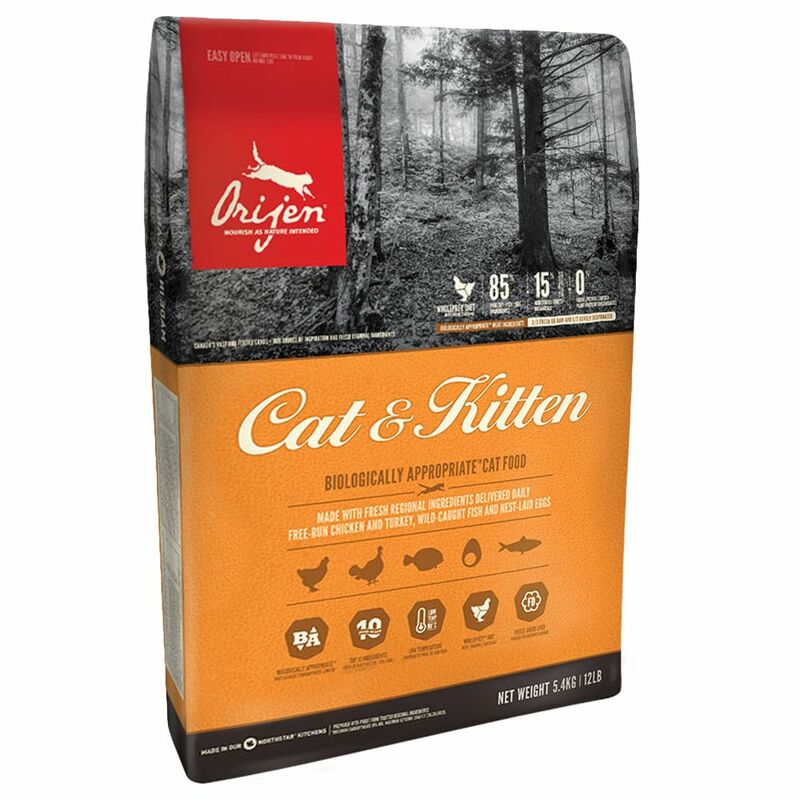 The recipe of Orijen Chicken Cat and Kitten Dry Food helps to meet your cat's nutritional needs, containing a balanced mix of different animal protein sources to form this top quality Canadian food. It follows the WHOLEPREY™ concept, which bases your cat's food around the natural nutritional needs of a cat in the wild. It is based around the idea of eating the entirety of prey, as your cat's ancestors would have, and this premium Canadian food contains a particularly high content of meat and fish (85%). Two thirds of this have been freshly prepared, with a third being gently dehydrated at 90 degrees; and providing an extra portion of valuable protein and energy needed for growth. Together with a varied mix of fruits, vegetables and plant extracts, your cat is naturally supported with all the vitamins and minerals it needs to stay strong, healthy and happy. Only the finest Canadian local produce goes into Orijen Chicken Cat and Kitten Dry Food, suitable for human consumption. It is delivered fresh daily from local agriculture, farms and fisheries. Meat, liver, heart, kidney and cartilage from free-range chicken and turkey; whole, wild-caught fish from fresh, clean water; nest-eggs; and regional field and meadow fruits offer plenty of animal protein (40%) and a variety of nutrients. This food, therefore, has no need for artificial additives, and is enriched exclusively with the valuable trace elements zinc, copper and choline. A glance at the ingredients list of Orijen Chicken Cat and Kitten Dry Food reaΒures you of its quality! It is an absolutely premium product for cats, coming from the undisturbed nature of Canada. Orijen Chicken Cat and Kitten Dry Food at a glance: Premium cat food for all ages and breeds 40% protein: with valuable amino acids and a high protein content to match natural nutrition for optimal growth Top quality: all ingredients from regional agriculture and fishers in Canada, suitable for human consumption and delivered fresh daily WHOLEPREY™ concept: with ingredients from muscle meat, liver, heart, kidneys and cartilage, to meet the natural nutritional needs of your cat as they would have been met by its ancestors in the wild 85% meat: particularly high content to allow sufficient energy and high quality animal protein for growth 2/3 fresh or raw meat: particularly beneficial, hearty and tasty 1/3 dehydrated meat: gently dried at 90 degrees; for high nutritional content and a concentrated source of protein Low glycemic index (0% grain): with limited carbohydrate content (19%), free from grains, potato and tapioca, for no fast-acting sugars which can lead to weight gain and diabetes Range of different animal protein sources: with free-range chicken and turkey, whole nest eggs from Canadian farms, and wild-caught herring and flounder from undisturbed waters in Canada 15% vegetables, fruits and plant extracts: large variety of local produce containing eΒential vitamins and for a regulating effect on the digestive system Free from grains, gluten,.